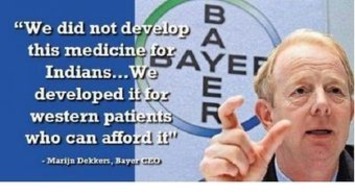 Home Newsletter PinUp: The Masters to Whom Pharma CEOs Are Beholden! [From www.washingtonpost.com] President Trump’s pick for health secretary previously served as a high-ranking executive at a pharmaceutical company that repeatedly raised the prices of its drugs, doubling the U.S. list price of its top-selling insulin over the five years he served as a company president. 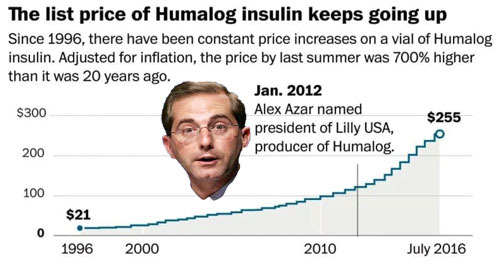 While Azar led Eli Lilly’s largest affiliate, Lilly USA, the U.S. list price of Humalog insulin more than doubled, from $123 per vial in Jan. 2012 to $255 per vial when he left the company in early 2017, according to data from Truven Health Analytics. Lilly, along with other insulin makers, was hit by a class-action lawsuit alleging overpricing of insulin earlier this year. Is This What the “Rank and File” Signed Up For? [From worldofdtcmarketing.com] Most pharma CEOs earn a lot of money and cozy up to Wall Street but what about the rank and file under them? Do these people tell themselves the PhRMA lie about the “value” their drugs bring to society in order to cash their paychecks with a clear conscience? With new cancer drugs commonly priced at $100,000 a year or more hundreds of thousands of cancer patients are delaying care, cutting their pills in half or skipping drug treatment entirely, a Kaiser Health News examination shows. It would be so easy for pharma CEOs to hold a joint press event and inform the public that “under no circumstances should anyone enter financial consequences because of our drugs” but that would of course make the Street very unhappy. 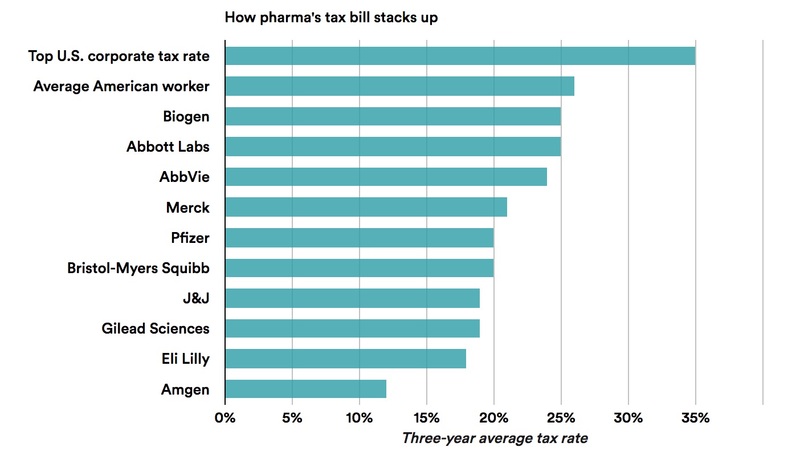 Big Pharma’s Effective Tax Rate is Lower Than Yours! [From www.statnews.com] Pharma has had a rocky relationship with President Trump since inauguration, but the two agree on at least one thing: Corporate taxes are too high. And yet the nation’s biggest drug makers aren’t paying anywhere near the top corporate tax rate Trump, and congressional Republicans, hope to slash. Over the past three years, the 10 largest U.S. drug companies paid an average tax rate of about 20 percent. That’s well below the top rate, which is 35 percent. And it falls short of the 26 percent rate paid the average American worker over the same period, according to OECD data. Furthermore, Big Pharma’s 20 percent tab likely overstates what drug makers are paying the U.S.